Enough colors to draw a beautiful rainbow! Well, maybe you do not have an artist eye, but a few of your students probably have a little Van Gogh in them. Our Porcelain Marker is a set of 12 different colors that teachers strategically use to present classroom lessons. Red can highlight the urgency of a class project and blue can put the finishing touches on a notable quote. All 12 of the Porcelain Markers provide indelible colors that only come clean by using our cleaning solution. You do not have to worry about the markers creating smudges or the colors bleeding into each other. 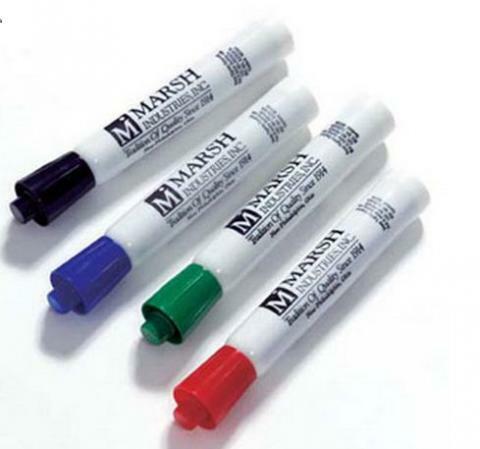 Teachers who utilize whiteboards made of rugged porcelain steel should consider ordering this set of 12 markers. The markers work best on melamine whiteboard surfaces.